About halfway up the Lake Agnes Tea House hike – if you’re anything like me – you’ll want to give up and turn around. My best advice: keep going! The start of the Lake Agnes Tea House trail is located just beyond Lake Louise and the Fairmont Chateau Lake Louise Resort. Chris and I read that parking lots fill quickly, so we arrived very early, at 8am. There were only a large handful of visitors strolling around Lake Louise when we arrived. Lake Louise – surrounded by jagged snow-capped peaks – was an absolutely stunning site, with the most vivid turquoise glacial waters I could imagine. In terms of conditions for the Lake Agnes hike, it was actually relatively easy. The trail was mostly a smooth dirt path. The trail was almost entirely uphill – at times pretty steep. And it was a longer hike (about 4 1/2 miles). The trip up took Chris and I about 45 minutes, and we were moving quickly without heavy packs. I was definitely feeling breathless at times. Chris and I were there in September, and there was already a chill in air. I started out wearing a fleece, windbreaker, a hat, and a scarf. The hike was enough of a workout that by the end, I was down to just my fleece. But here’s the good thing: although it’s a bit of a workout, the trail is overflowing with incredible, panoramic, sweeping views. As we made our way higher and higher, there were a few spots where we could look down on the pure turquoise waters of Lake Louise below us. And the Canadian Rockies are truly stunning. We saw glaciers and jagged, rocky peaks stretching for miles (and the peaks were snow-capped in September). Everywhere we turned was green, untouched Mother Nature in every direction, accented here and there by the most incredibly-colored turquoise glacial lakes and rivers. So there were plenty of opportunities to stop and take in the sweeping views and snap photos. Which doubled as little breaks to catch my breath! The panoramic lookouts all along the path are really reason enough to do the Lake Agnes Tea House Hike. First, we saw the Lake Agnes Tea House, which was a quaint little log cabin. The Tea House had several tables inside and picnic tables outside on a covered porch, with stunning view of Lake Agnes. The menu offered a variety of teas plus coffee and hot chocolate. The foods that were offered included homemade soups, sandwiches, and baked goods like banana and pumpkin bread, chocolate chip cookies, and apple crumble. Although Chris and I hadn’t planned on having breakfast or lunch, the Tea House menu was really tempting and certainly offered enough delicious-sounding items that we almost changed our plans! After exploring the Tea House, we took in the view of Lake Agnes. 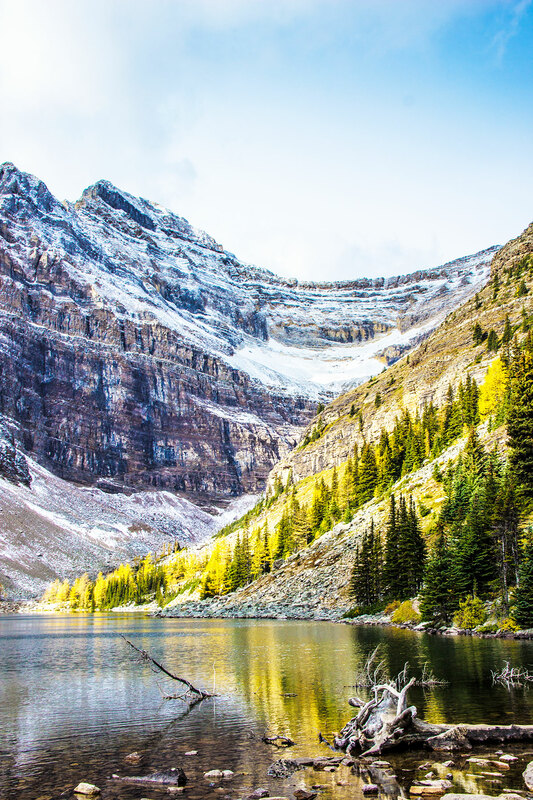 Lake Agnes is a small glacial lake accented with towering, rocky, jagged peaks. It looks beautiful in photos. But in real life, it was truly incredible. From Lake Agnes, there was an option to continue on the trail to the Big Beehive trail (with views overlooking Lake Agnes) and onto the Plain of Six Glaciers (to make it a full day hike). But Chris and I decided to head back down to Lake Louise. Although the crowds were growing by the minute, we made our way to the Fairmont Chateau and found we only had to wait about half an hour for a table at the cafe overlooking Lake Louise. The views were amazing. And lunch tasted as wonderful as food always tastes after you’ve been hiking outdoors and worked up an appetite! Beginning to end, the Lake Agnes Tea House hike was one of the most scenic and memorable hikes Chris and I have ever done. How Difficult is the Lake Agnes Tea House Trail? The trail is mostly a smooth dirt path, very well-marked and easy. The hike is mostly uphill, at times quite steep. The first part of the trail is actually the steepest. You’ll know you’ve almost made it when you reach the stairs (phew)! At the time of the hike, I felt I was in moderately good shape (strenuous yoga several times a week and 2 mile walks several times a week). And I found the hike up a bit tiring – where I needed to stop and catch my breath for just a minute – a few times along the way. How Long is the Lake Agnes Tea House Hike? The Lake Agnes Tea House Hike is about 4 1/2 miles. Chris and I hiked the trail in about 45 minutes, and that was moving quickly without packs. How Crowded is the Lake Agnes Tea House Hike? My understanding was that both the trail and the Tea House can get extremely crowded. And that the parking lots fill quickly at Lake Louise. However, neither the trail nor the Tea House were crowded when Chris and I did the Lake Agnes Tea House hike. We visited on a weekday in September and arrived at the trail early in the morning, at 8am. We crossed paths with several hikers along the way. There were maybe 30 or so visitors at the end of the trail, taking in Lake Agnes and enjoying the Tea House. By the time we made our way back down to Lake Louise and the Fairmont, the crowds had arrived! If you’re interested in avoiding crowds, I’d definitely recommend starting out first thing in the morning. You’ll definitely want to wear layers and comfortable walking/running shoes for this trail. Chris and I didn’t have hiking boots, we wore our Nike sneakers, and found that hiking boots weren’t necessary at all. I found the weather chilly when we did the hike in September. I wore a fleece, windbreaker, scarf, and hat. I was happy to have layers I could remove as the uphill workout got more intense and I warmed up! The trail was not all shaded, so you’ll probably want sunscreen in the summer. 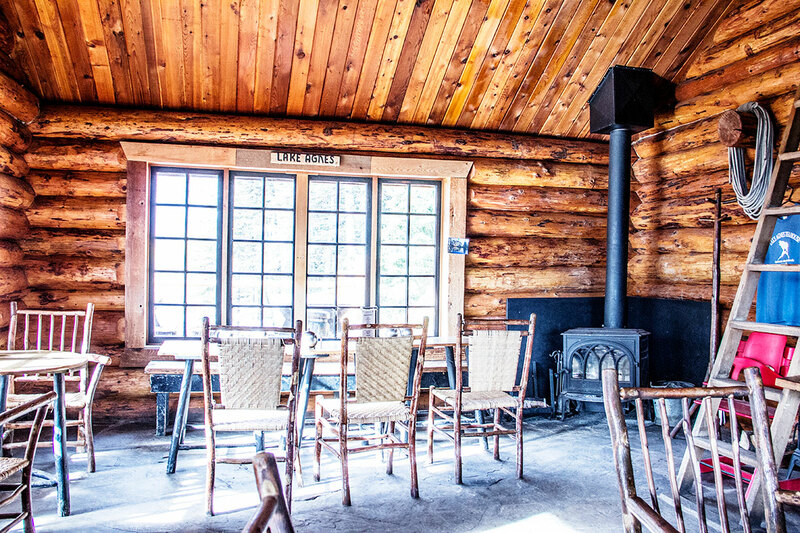 There’s enough on the Lake Agnes Tea House menu that you can plan to have breakfast or lunch when you arrive. The menu is not too extensive (sandwiches, soups, and baked goods), and prices are moderate. Chris and I decided to wait until we hiked back down to have lunch at the Fairmont Chateau. The prices were expensive, but the experience – the restaurant had stunning views of Lake Louise from wall-to-wall, floor-to-ceiling windows – was worth it!